The majority of dogs receiving regular exercise do not need their claws clipping providing part of their routine walk is on pavement as this acts as an emery board in keeping the claws trim. Older dogs may well require routine claw clipping as they may be having reduced exercise and owners may have changed their habit in keeping life a little easier for the dog by driving him/her to the walking area. Which perhaps then misses out the pavement walking! When clipping claws, it is important to be prepared before you start. 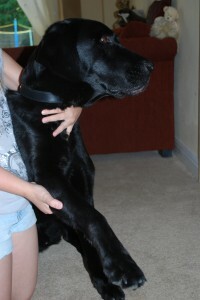 Possibly have someone helping hold the dog for you. 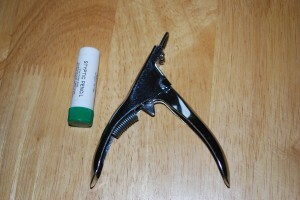 I prefer the guillotine type of nail clipper. I also keep handy, a Styptic pencil. You can buy one of these easily in the supermarket (men’s shaving section!). Please follow the instructions carefully of the styptic pencil. It is better to clip a small amount of claw than to cut the “quick” and make the “quick” bleed. I prefer to aim for between 2mm-5mm. If the claw is obviously excessively long I would still only want to clip 5mm, re-assessing the length of the nail before attempting to remove any more. 1) If you need someone to help. For clipping claws on the front legs, whilst the dog is sitting, the helper much have one arm around the dogs neck to cradle the head (giving the impression of a cuddle rather than restraint! )and the other arm holding behind the elbow (to reduce the drawing back), this extends the leg forward. This position alters for the back legs but keep the dog sitting (if he is calm and not wriggling) and still cradling the head. If this method doesn’t work have the dog laying down with the helper leaning over the dog (using their body) to try and make him/her feel secure. If your dog is too wriggly then you may have to admit defeat and ask your vet to do the claws as you could end up clipping the claws too short by mistake! The key factor is holding behind the elbow to extend the leg securely. 2) The person doing the clipping must hold the paw holding the pads flexed slightly which will give better visibility of the claw. using the thumb to push down on the toes to expose the claws. 3) Before clipping the claw, look to see if the claw is black or white – white claws are easier as you will see pink inside the claw which is the vascular “quick“. Clip so that you do NOT come near the quick. 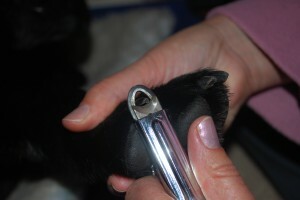 If the dog has black claws it is better to clip only a couple of millimetres and make another assessment. If you do catch the quick you will need to use your caustic pencil to stem the flow of blood. The concern with catching the “quick” is that it encourages the quick to grow to the end of the claw and thus increasing the chances of you catching the “quick” every time. 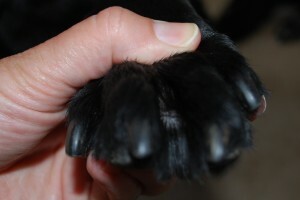 If you do not check your dogs claws, long claws will make your dog “place” its paws differently possibly causing pain in the older animal whilst he/she is walking as it has changed the dogs regular gait. Also very occasionally they will grow so much that the claw then grows into a long curve and embed themselves into the pads of your dog. Which is very painful. This would require veterinary intervention as possibly an infection may also result. So even if you do not feel brave enough to clip your dogs claws yourself it is still important that you check your dogs claws regularly. Particularly if you know your dog is not having as much exercise as he/she used to have. An alternative to using the styptic pencil to stem the flow of blood, should you catch the quick – is to use a wet teabag!